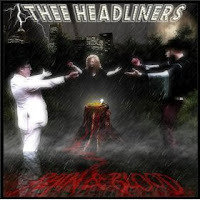 Thee Headliners open Saturday night of Slabtown's Bender, ensuring that I'll be showing up early (the closing set by Germany's Teutonics means I'll probably being staying late too). I imagine their opening slot likely has less to do with their quality or following and more to do with them playing a show last week the Kenton Club. The band was first recommended to me, along with Pure Country Gold, at October's Garagefest while discussing local bands to rival the scene in Memphis. Not surprisingly, the best cuts off Rain & Blood are lively dive bar rock n' roll. The gruff JT Halmfilst and powerful Holly Hotbox shout it out over a charging riff on "Sketch City" while the organ bounces on girl group-loving "Uplifter '09" and whirls "Sourpuss" up into a go-going frenzy. Overall, it's a good-timing dance-friendly mix of blues and garage rock. Too bad the album art is so cheesy. I was writing up some interview questions for Thee Headliners since they just celebrated their 10th anniversary as a band, but someone beat me to it and it's a great interview.